I've long been meaning to read Lynda Barry's books, which are a mix of graphic narrative, autobiography, fiction, and essay. stephenhongsohn has reviewed three of her books—One! Hundred! Demons!, The Good Times Are Killing Me, and Picture This—previously here on AALF. 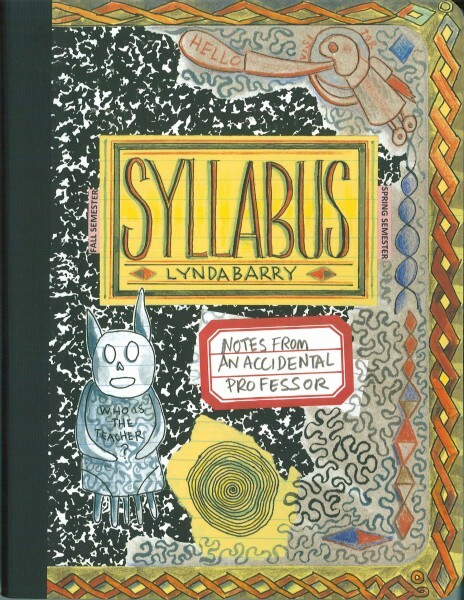 I finally picked up her recent Syllabus: Notes From an Accidental Professor (Drawn & Quarterly, 2014) this week, and I loved its take on journaling and drawing as well as its documentary format of Barry's teaching experiences. The courses she discusses in the book are about writing and drawing by hand as a practice of observation and developing a sense of one's own "line." What is particularly fascinating to me about Syllabus is how it offers a snapshot of Barry's philosophy of daily writing/drawing as a practice. It reminded me a bit of Betty Edwards's bestselling book Drawing on the Right Side of the Brain and the follow-up book Drawing on the Artist Within (see her website Draw Right). I obsessed over both books when I was an aspiring visual artist in high school, not because they were manuals for how to draw but particularly because they offered a kind of cognitive overlay to the practice of seeing shapes and rendering them accurately by hand. Her approach is to teach people how to short-circuit all the shortcuts that our brains have developed to see things that then translate to drawings that are not photo-realistic. In one exercise, she asks readers to copy a line-drawing portrait of a person, holding the image upside down. Focusing just on the lines and the shapes created by the lines rather than whether you are drawing an ear or an eye or a hand, most people are able to render the portrait in a much more faithful way than if they had tried to copy the same drawing right side up. In a similar fashion, Barry has a take on the mind and writing/drawing by hand. She focuses not on rendering photo-realistic art, however, but instead on accessing a sense of creativity in embracing one's unique handwriting and drawing style. Instead of short-circuiting the shortcuts that our brains make when seeing things, she is more interested in a cartooning philosophy (borrowed from Ivan Brunetti) that encourages people to observe the world closely on a daily level and to make drawing and writing a steady practice. Indeed, she is not interested in whether you like or do not like something you've drawn or whether a page you've filled is beautiful and frameable; instead, it is all part of an accretion of work that defines your sense of your own voice on the page. It sounds like her classes enact a kind of discussion of students' work that is antithetical to the traditional "critique" in art classes where students all display their works and have everyone else comment on them, analyzing them for the strengths and weaknesses. Instead, Barry has her students display their works anonymously, and they do not spend time talking about what works or doesn't work in a particular drawing. Most of the engagement they have with each other's work seems to be about building on that work through copying, inking others' pencil drawings, coloring others' inked drawings, adding to a series of panels in a comic strip started by others, etc. Barry states clearly in her syllabuses, in fact, that the class is for people who can draw and for those who can't draw, and she is in fact interested in the kind of drawing that we often dismiss as "childlike." She asks what it means for adults who have not drawn since they were kids to start drawing on a daily basis. In this way, Barry's approach is a little more about accessing creativity as a general principle, more along the lines of Edwards's second book geared towards professionals in various corporate settings who might benefit from thinking outside the box. As you might guess from the cover image for Syllabus above, Barry is a proponent of using those iconic black-and-white marble covered composition notebooks for daily writing and drawing. The book itself includes pages from the syllabuses for her classes, all drawn in her comic book style. There are also many examples of exercises from her classes and her students' work—both their drawings reproduced directly and her recreations (via copying) of them. Her writing and drawing exercises are geared towards getting students to observe things in their lives in a different way, at a different pace (via writing and drawing by hand) as well as with a different relationship to listening. She has students work on drawing exercises while listening to audiobooks, recorded lectures, and interviews about various topics as well as to music and while eavesdropping in public places. This listening aspect is something I definitely find interesting about the practice of drawing. Drawing activates your brain in a unique way, and it allows you to engage with the world outside (or shut it out) in a powerfully different way than trying simply to pay attention (or to meditate quietly). There have been numerous research studies, for instance, about how doodling during class helps students focus and also remember what they hear better. (Some of these more recent studies focus on the importance of doodling by hand, noting that the widespread use of laptops in classes these days, even for note taking, does not create nearly the same kind of benefits as doodling and taking notes by hand.) There is something important about the physical act of making those lines on the page that helps the brain focus and encode experiences, and Barry's exercises draw heavily on this understanding. I, for one, will make a renewed effort to pick up the practice of recording some daily observations by hand in the many notebooks I have lying around. thanks for the review; i've been so utterly enthused that D&Q have also been putting out some of lynda barry's older material that has gone out of print! !